The trombone is a brass instrument made up of a mouthpiece, first brace, second brace, slide, water key, tuning slide, and bell. It derived its name from the Italian words tromba and one which means “trumpet” and “big,” respectively. The trombone was first used in the Medieval Period and was known popularly as a shakbusse or sackbut during the Renaissance and Baroque eras. It’s a versatile musical instrument that can be found across different genres. When you hear a trombone solo in an orchestra, it is likely an alto trombone that the musician is using. These trombones are pitched higher than tenor trombones but in reality, the tenor trombone is still able to cover most of the range found in the alto trombone. Alto trombones sound higher than regular trombones and they normally play the highest trombone parts in the music. Of course, alto trombones are not incredibly common these days; therefore, the tenor trombone plays a lot of the parts intended for the altos. The alto trombones are usually found in the key of Eb or F, although they can also be found with a rotary valve attachment that puts them in the key of Bb or D. Their sound is a fourth or fifth higher than the tenor trombone. They were mostly used in the 1500s to the 1700s as a high part in brass bands and choirs. Starting in the early 1800s, the alto trombone declined somewhat in popularity because other trombones became more established and the trumpet acquired valves, which means that other instruments began playing the parts that once were reserved for alto trombones. The trombones’ slides are somewhat short and they have been used in dozens of choral, operatic, and orchestral compositions throughout the centuries. On a bass trombone, the length is the same as the straight tenor trombone but the bell is somewhat larger. It is a larger-bore version and adds a second rotor that extends its low end a lot further than the straight tenor trombone. Along with other types of trombones, it is found in numerous orchestras, bands, and brass choirs. It is made in the key of Bb but has one or two valves that are able to extend the range to F and D, which is something it has in common with the larger-bore tenor trombones. It has one or two triggers and sounds much better than other types of trombones when lower octaves are played. Most bands have only one of these trombones and if the song doesn’t have a specific part for the bass trombone, the musician simply plays the third or fourth trombone part. This trombone’s extended low range and agility mean that it is a great instrument for performing solos. With a warm sound that can go from bright to mellow, the cimbasso trombone has three to six valves — either piston or rotary — and is usually pitched in Eb, F, or C. Its range is the same as a tuba or the contrabass trombone. It is not always found in regular bands or orchestras but it has been used in various operas from Aida to Oberto. It is also often heard in soundtracks from major motion pictures. In the early years, the cimbasso trombone was upright and had a narrower bore that it does now. It was often made of wood, except for a brass bell. It is still a conical-shaped instrument and it can be found in some reed bands and military brass bands. It also has a very low range and sounds very similar to the contrabass trombone. The original cimbasso trombone was developed by composers Verdi and Pelitti, in part because they were unable to find a trombone that had a sound they wanted to use in their compositions. Contrabass trombones have the lowest sounds of any of the trombones used today. They often have double slides instead of regular ones, which means that the slide wraps twice instead of once as it does on the tenor trombones. Contrabass trombones are usually either in the key of C or the key of Bb. They are an octave below the tenor trombone and can come with or without valves. In addition, some also have a double slide so that the slide’s positions are just the same as those of the tenor trombone. In professional settings such as orchestras and operas, the contrabass trombone part was often played by the bass trombone or even the tuba. These days, however, the contrabass trombone is always used instead and the bass trombonist is usually able to play both parts. Also called a flugel-bone, the marching trombone sometimes resembles a large cornet but its sound is 100% trombone — full and bold. 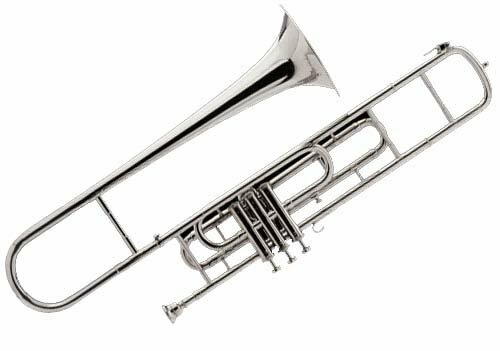 Because of its compact design, the marching trombone is a lot easier to carry than other types of trombones and it can play virtually the same pieces of music as those other types of trombones as well. The marching trombone looks very similar to a flugelhorn and it is usually made in the key of Bb. It is much easier to march with than a regular trombone due to its size; even though it is similar to a trumpet, it sounds closer to a trombone. While the soprano trombone is pitched at the same octave as a trumpet, a piccolo trombone is pitched two octaves about the tenor trombone and just one octave above the soprano trombone. The piccolo trombone and the piccolo trumpet are pitched in the same key and they even use mouthpieces of the same size. Therefore, the piccolo trombone is essentially a piccolo trumpet with a slide. It is also much smaller than other types of trombones, usually only one-fourth of the length of the standard tenor trombone. Extremely rare instruments, piccolo trombones have bore sizes that are roughly half an inch in length and bell sizes that are approximately four inches in diameter. They are played mostly by trumpet players. Soprano trombones resemble very small slide trombones and they are often called slide trumpets. It originated in Germany and is used very often in jazz settings. Soprano trombones aren’t used very often today, in part because most of their parts now go to instruments such as the trumpet or even various woodwind instruments. These trombones are made in the key of Bb, an octave higher than the tenor trombone. One of the reasons why they are so uncommon is because they are difficult to play in tune and because other instruments have taken over most of the parts designed for them. Soprano trombones are sometimes given to trumpet players to play because most trombone players are not too keen on playing them. In fact, the mouthpiece is exactly the same as that of a trumpet nowadays and they even sound much closer to a trumpet than they do a trombone. This type of trombone is the simplest type of trombone and the one that most people think of when they think of the word “trombone.” It is a basic type of trombone that has no tubing on the inside of the main section. It is also called an F-rotor trombone and has extra tubing within the first, or main, loop. The horn becomes longer as you play it and the tuning changes from Bb to F. It is played when a slide is pulled in and out and although most trombones are played with bass-clef notes, some can play treble-clef music. In addition, some of the more expensive tenor trombones have an F attachment, which means that they can play extra notes that other tenor trombones cannot play. 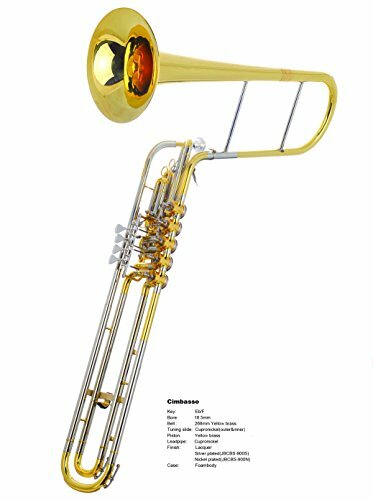 This type of trombone is also good for beginning musicians because it is an inexpensive instrument that is very easy to learn on. The tenor trombone is also called a trigger-type trombone when it has an F attachment because there is a trigger attachment that allows them to play in the key of F and even lower whenever necessary. Invented in the 1800s, this trigger attachment originated in Germany and the horn includes additional tubing that is activated by the trigger. In other words, the F attachment is a trigger that allows the horn to play lower notes. The trigger can either activate or deactivate the extra tubing, giving the player a wider range of notes to play. This means that you can change the note without moving the slide mechanism simply by using this trigger. Tenor bass trombones were used at one point in the mid-1900s but are now obsolete. It was essentially a standard tenor trombone with an F attachment. Up until they were made, only bass trombones had this attachment. Now, it is the tenor trombone that has the F attachment. 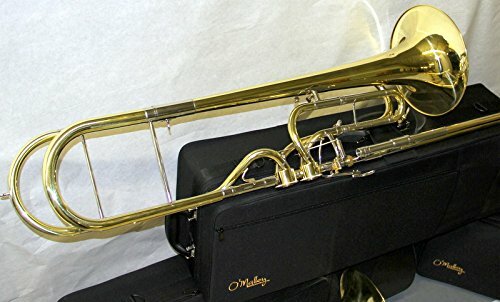 You can occasionally find a tenor bass trombone for sale in online stores that sell retro items; they are usually made of brass and are silver-plated. Valve trombones are similar to regular trombones but they also have three valves, just as a trumpet or euphonium does. Although valve trombones come in various sizes, the most common type of valve trombone is the tenor valve trombone. In fact, while other types of trombones are very popular in the United States, the valve trombone is actually more popular than the slide trombone in countries such as South America, India, and Europe. With the valves, the trombone is able to play faster music a lot more easily, which is especially helpful when playing complicated or more difficult pieces of music. Are Trombones the Voice of God? Some composers have described the sound of the trombone as being similar to the voice of God. The trombone can stay in perfect tune for a very long time, in part because it is essentially one big tuning slide. It is also the instrument that has a sound which is closer to a human voice than any other instrument. The instrument is popular with composers; Beethoven even had a trombone quartet at his funeral and its melodic sound can even reveal a type of glee and sadness that other instruments are unable to manage. Because they rarely have the melody in a composition, a lot of musical arrangements have very short parts for the trombone players, meaning that they often sit around and wait a lot while playing a particular piece. In fact, in some compositions have rests in their music that lasts anywhere from thirty to forty minutes at a time, which is a very long time to sit there while others are playing. Thankfully, there are compositions that are heavy on the trombone parts, meaning that the instruments are sometimes highlighted and allow the players to play their instruments a lot. If you’ve ever listened to the background music in commercials or even some television shows, you can often hear a trombone sneaking through. For example, the teachers’ “talking” parts in the Charlie Brown and Peanuts cartoons are trombones with mutes inserted. If you listen carefully to other shows, movies, and commercials, you are very likely to hear other trombones as well. The trombone started as an instrument called the sackbut. This name came from a Middle French word that means “pull, push,” which is appropriate because the trombone’s slide is pushed in and pulled out while playing. During the 1600s, the sackbut was a well-known instrument that was used in court musical settings and in sacred types of music. Naturally, the instrument has changed quite a bit from the time it was called a sackbut to the trombones of today but the origin of this instrument is interesting. Trombones are made for right-handed people so if you are left-handed, you’ll have to play the instrument with your “weaker” hand. This can be difficult to do but many left-handed musicians have become professional trombone players. One of these includes Slide Hampton, one of the best jazz trombone players in history, who was also a southpaw. As of this writing, Mr. Hampton is 86 years old and he is considered one of the best trombonists ever in the history of music. The first documented trombone came on the scene in the mid-1400s when the Duke of Burgundy got married and had a trombone at his wedding. It was mentioned in a document in 1488 and the wedding itself took place twenty years earlier. The oldest trombone was made in 1551. However, no mouthpieces remain from that era. The earliest mouthpieces have the mark of the Schnitzer family, a company that made trombones in Nuremberg starting in the 1500s. There are, however, newer trombones that are still considered antiques that you can find if you search the Internet. In fact, trombones were not even included in an orchestra until the late 1800s to early 1900s. Even today it is uncommon to hear a trombone solo except in a few jazz ensembles. A man named Eric McGavin once invented a one-handed trombone that also had a double slide. Beethoven was the first composer to create a composition that featured the trombone; it is found in his famous Fifth Symphony. Famous trombone players include Slide Hampton, Paul Newman, Tommy Dorsey, Nelly Furtado, and Jonathan Frakes as well as the former Prime Minister of Canada, Jean Chretien. In addition to Beethoven, other composers have added trombone parts in their music, including Leonard Bernstein, Arnold Schoenberg, George Gershwin, Igor Stravinsky, Sergei Prokofiev, and Gustav Holst. Slides are unique to the trombone as no other brass instrument has them. When you pull the slide out, the notes get lower, and when the slide is pulled in, the notes get higher. Trombones are used to portray dark, somber moments in many different operas, including “Don Giovanni” by Mozart and “Till Eulenspiegel” by Richard Strauss. Bell: Bells are part of every brass instrument and are imperative to get the right tone and sound projection. Not only does the size of the bell make a difference in the sound the instrument makes but so does the type of brass used. Yellow brass always results in bright, loud tones while rose brass results in a tone that is much warmer and softer. Bore: The bore refers to the hollow space that runs through the center of the tubing. Bores come in many different shapes and sizes. Embouchure: The embouchure is the mouth position required to play a certain instrument. It describes the position and the shape of the player’s mouth as he or she plays. For brass instruments, the lips need to be centered on the mouthpiece and there needs to be good facial muscle control in order to make the right sound. Finish: The finish, or top layer, of a brass instrument, is usually either silver or lacquer, producing either a silver or gold coloring. Most often, warmer tones come with a lacquer finish while brighter tones result from a silver finish. Finger Hook/Thumb Hook: This is a small metal hook that houses your thumb or a small ring that houses your little finger. These devices make the instrument easier to hold and keep your hand in the right position so that you can balance it and play without jumbling up the sound. Hand-Hammered Bell: Found mostly in more expensive instruments, this is a bell that is hand-hammered in order to create a perfectly symmetrical shape, which means that it will sound the way it is supposed to. Lead Pipe/Receiver: This is the first part of the tubing and the part that the mouthpiece fits into. Monel Valves: Monel is a metal alloy and it is what the valves are made of on different brass instruments. Not all brass instruments have this type of valve but they are the highest in quality of all the valve types. Mutes: Mutes are devices that fit into the bell of a brass instrument and that mute or alter the sound it produces. The sound is a unique, almost stifled, sound that is required in many types of music. Piston Valves: When a brass instrument has valves, they are usually piston valves. The only instrument that this does not apply to is the French horn. The tops of the valves have buttons that the player presses and the inside of the valves have holes that air passes through. When both are done together, it produces a very unique sound. Rotary Valves: Rotary valves usually turn in a clockwise direction, unlike piston valves that are pressed down. They are most commonly found in French horns. Slides: These are featured in all brass instruments and can usually be found placed next to the valves in order to alter the tuning of the instrument. In the case of a trombone, however, the slide is moved in and out. Trigger: Triggers are mechanical levers that let a player temporarily adjust the tuning of certain notes. This is done by lengthening the main valve or tuning slide. They are only for use by an experienced player; therefore, you cannot find these levers on the instruments made for beginners. They are mostly found in cornets, trumpets, and sometimes even euphoniums. Water Keys: Water keys are usually found on the lowest parts of the instrument. They are spring-loaded and are opened to release excess moisture from the inside of the instrument, which happens frequently if the musician has been playing for a long time.